Looking for a gift for your loved indoor plants? 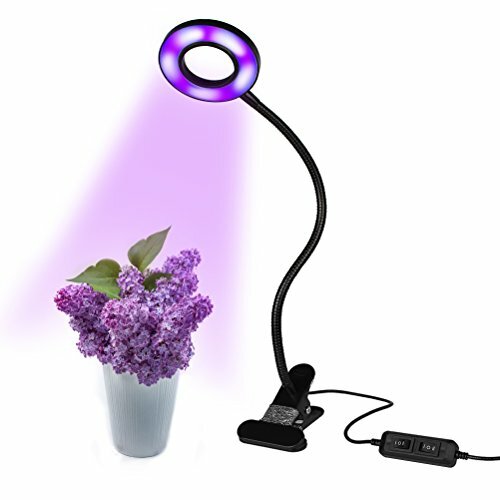 Try this LED Growing Light. Bring a sun inside your home for your plants. 10w 18pcs LED bulbs for growing your indoor plants. Built in USB cable with simple-to-use buttons to adjust and creat a comfortable lighting environment. 2 lights(blue&purple) for different growing phases, making it easy to provide the perfect light to make sure that you have the best yield. 360 degree adjutable gooseneck for ultra convenince, easily fix on desk or table. Can be used in house garden, pot culture, garden, sowing, breeding, farm, flower exhibition, garden, green house and more. Designed with 18 LED bulbs(12 red and 6 blue), the red lights(630-660nm) helpful blossoming, and the blue light(450-470nm) promoting the growth of the sprout leaves and stems. 360°adjustable gooseneck with a sturdy desk clip to fix on desk or table, thus convenient to move it to promote the plant to absorb the light to grow quickly. Use occasion widely such as balcony, greenhouses, darkroom, office and so on. And also suitable for gardening, family balcony, seeding/breeding, flower show, potted plant and more. Press simply the dimmer switch to switch the brightness of the light. Energy saving, lower heat and lower power consumption, high luminous efficiency and long service life. Install and use easily. Adjust the lights height and angle freely, flexible use it everywhere. If you have any questions about this product by IUNIQEE, contact us by completing and submitting the form below. If you are looking for a specif part number, please include it with your message.